When I’m in L.A. for business, I do my best to squeeze in a few social visits. Last night, I enjoyed the chance to catch up with my friend Tony. We were both at a loss of where to go. We decided we could both stand a good burger. And so we agreed on Father’s Office in Century City, out there by the old Helm’s Bakery. I had never been there and it had been a good long while for Tony. As someone who works to build brands and positive, purposeful brand communications, this little episode really stuck with me. Tony and I laughed it off, but only after we made a few loud comments to each other, “What kind of restaurant doesn’t serve ketchup?” “Well, aren’t we all super strict here in Father’s Office? No modifications and no ketchup, gosh darn it!” I mean, really. How can any restaurant take themselves that seriously? Why do people in LA like to go to restaurants where they’re treated like crap? Because that’s what “no modifications” and “no ketchup” say to me. Please be aware of our menu policy. We do not permit any substitutions or modifications to any of our menu items. Outside food and beverages are not permitted. Dessert items including birthday cakes are not permitted. Father’s Office may have a great beer menu, but this ridiculous Menu Policy spoils all the fun. 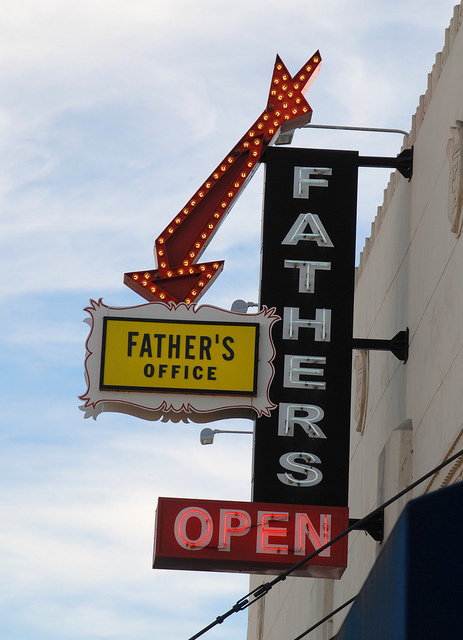 I won’t be doing business at Father’s Office again. I’m not able to make any modifications to my schedule. From the moment I saw Joe Lamb sitting on the swing set holding a locket, without being able to see what photo was inside, I fell in love with the movie SUPER 8. I realize I’m not seeing this movie the weekend on opening weekend, and so I am well aware of the references to the classics E.T., STAND BY ME and GOONIES. The film deserves these grand comparisons for giving us rich characters we can care about, and for whom we can suspend reality for a couple of hours. The military cover-up of alien encounters is not a fresh story, but Abrams lets us simmer in suspense, when most movies would show guts, gore and too many details from the get-go. Yes, there are lots of special effects, but the relationship between the characters drives the story forward. Joel Courtney who plays Joe Lamb delivered and outstanding performance. In one moment of defiance, he commands the scene and even overshadows Kyle Chandler who plays his father, Jackson Lamb. He’s the quiet leader among his pack of friends. Zipping through streets on bicycles and unable to reach parents via cell phones made me long for that time of innocence. Ryan Lee was a spot-on comic in his role as Joe’s friend and pyromaniac, Cary. Riley Griffiths, as Joe’s best friend, Charles also gives a notable performance. Elle Fanning’s Alice, the lone girl among the group of boys and the love interest of both Joe and Charles is sweet and charming with understated strength. 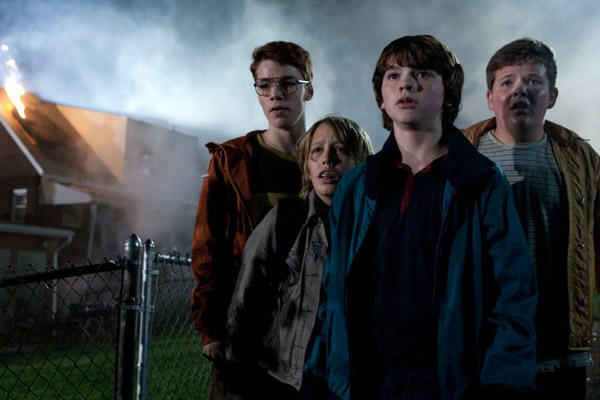 Like the young characters in E.T., STAND BY ME and GOONIES, the movie-making kids in SUPER 8 are likable, memorable, and very believable. After having just seen the much over-hyped film, BRIDESMAIDS (which I won’t even bother reviewing), I was so pleasantly surprised with SUPER 8, which to me, was a return to a classic style of filmmaking, a well told story and focus on the characters. If you haven’t had a chance to see this film yet, treat yourself to a matinee and sit back and enjoy. During the past eight years abroad, there were lots of things I missed about life in the US. Eating “strange” foods a lot of the time in Asia, one often misses the basics. For me, that was pizza, Mexican food and cheeeeeeseburgers. On the few occasions I did make visits to the US, I would enthusiastically request that my first meal be In-N-Out Burger. Didn’t matter if my plane landed at 10:00am or 10:00pm, I needed my cheeseburger. In-N-Out was my first meal when I returned from Japan back in 2007. This past Wednesday, I attended the Taste of Little Italy event. (You can read my post about that HERE.) One of the better restaurants was the Burger Lounge, which offered fist-sized “sliders” of beef or veggie burgers (officially Grilled Lounge/BL Vegetarian on their menu). They were both delicious. With some restaurants offering samples in jello-shot sized containers, a generous sample was welcomed and memorable. So my friend Michelle and I decided to return to Burger Lounge yesterday to have a casual night out in Little Italy and downtown for the Memorial Day weekend. On this visit (and trust me, there will be many more), I opted for the Grilled Turkey Burger, while Michelle went for the Crispy Chicken Tenders, served on a stick. We also shared the 1/2 and 1/2 of the nicely seasoned onion rings and french fries. This second visit resulted in lots of flavors dancing on my tongue and making me a very happy girl. I loooove a good burger! The Turkey Burger has the perfect amount of basil with the white cheddar cheese complimenting the creation nicely. The chicken tenders were definitely crispy, offering good texture and a scrumptious bite. Burger Lounge is dedicated to serving high-quality products which are super tasty, as well as being environmentally friendly and healthy. The beef is all natural, 100% forage/grain fed, free-range moo moos. All animals are hormone, antibiotic and byproduct free. Great focus is placed on the source of the food they serve. In addition to their burgers, BL serves tossed salads and cupcakes for dessert. I’m looking forward to trying both of these items. The Little Italy location is a great spot and I imagine I will take advantage of their patio dining in the warmer summer months. 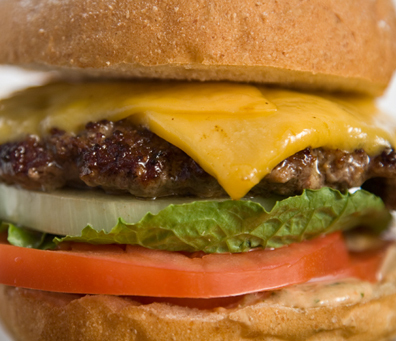 Another Burger Lounge is due to open in the GasLamp Quarter soon. You can also find them in Coronado, Hillcrest, Kensington and La Jolla. While I still love In-N-Out, I am 100% sold on the Burger Lounge quality, taste and experience. Folks, I have found my new burger heaven. Likes: Pretty much all of it at this point. With a friend visiting from out of town, I wanted to savor a simple, tasty and enjoyable dinner for the four of us. We all met in Little Italy at the Princess Pub. Great place to enjoy an afternoon beer, by the way. When my friend Shawn told me that our dinner reservation was at 6:30pm, I felt like we were trying to catch the sunset dinner special or some senior discount. 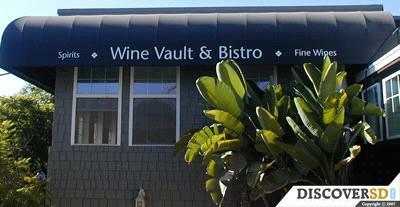 In fact, we had reservations further up the road at The Wine Vault & Bistro. Here you are served a set menu of five courses, paired with five wines and everyone in the restaurant is enjoying the same meal. Me likey. When you are hosting an out-of-town guest, it’s nice just to sit down and have everything decided for you. Perfect for catching up with a friend I haven’t seen in nearly a decade! The atmosphere of the Wine Vault & Bistro is a homey setting, literally within a house on the hillside of India Street at Washington. The soft lighting and white interior make for a warm glow, but bright enough you can see what you are eating. And boy did we eat. The five course portions are perfectly sized, and yet really fill you up. A well rounded menu, we were served spring vegetables, a deliciously petite and well seasoned fish ‘n’ chips, a crispy chicken roulade with a tasty curry cous cous, lamb osso buco and pistachio cake. The lamb was the least creative and therefor my least favorite dish. The 3-bites of the fish ‘n’ chips were simply perfection. Each course was paired with a wine, which you can purchase from the Wine Vault Bistro. In order, we were served a 2009 Mauritson Sauvignon Blanc, 2009 Cass Viogner, 2005 Garmendia Tempranillo, 2006 Tobin James “Blue Moon” Syrah and finally a 1999 Domaine Fontanel Rivesaltes Ambre. I’m not a big fan of dessert wines, and so the Domaine Fontanel got only one taste from me. The Cass Viognier is an absolutely perfect summer wine, very bright fruity tones and nearly sparkling. I loved this one. On the reds, I rather enjoyed the bold tones of the Tobin James. It was a perfect selection for the lamb. With wine flowing and well-timed dishes landing before me, I could easily relax and enjoy my friends, which is exactly what we wanted for the evening. Our meal lasted well over four hours and with great satisfaction. The set menu and wine flight were $50 per person, a very reasonable price for the meal. While I loved my visit at the Wine Vault & Bistro, it is not the style of restaurant which becomes a weekly habit. It’s great for a date, a gathering of friends or for wine enthusiasts and foodies who want to test the skills of a capable chef and see what creations he’s come up with for the evening. The calendar of events on the website is wonderfully full of winemaker dinners and tasting events. Every Saturday is the Chef’s menu, as we enjoyed. I’ve signed up for the newsletter and to learn about singles events. I can see a potential business opportunity here as the Wine Vault & Bistro is nowhere to be found on Twitter or Facebook. On a side note, I’d make sure you have a designated driver. With a 3oz. pour per tasting, and all that delicious food, best to have someone with a clear head drive you home. Likes: Great wines paired with a tasty menu with lots of variety. Tasting notes provided for each wine, as well as the set menu. Generous pour. Dislikes: Location is tough on parking. A visit to their website crashed my computer. My friend and I were 100% in the mood for a chick flick. We debated seeing WATER FOR ELEPHANTS, but put that idea aside for a little more cheese, SOMETHING BORROWED. It met my expectations and filled the chick flick craving nicely. SOMETHING BORROWED had all the right elements, the two best friends who are not quite alike, with Kate Hudson’s character, Darcy, being the more fun, flirtatious and outgoing gal and Ginnifer Goodwin cast as Rachel, the more, studious and dowdy girl. Goodwin isn’t a perfect fit, though, as she came across on screen as the aesthetically more beautiful of the two. But Goodwin knows how to play the self-effacing, hopeless girl a la HE’S JUST NOT THAT INTO YOU and Kate Hudson has already been down the road of more vivacious, overbearing, kind of bitchy friend in BRIDE WARS. So the role for each of them is not new and perhaps a bit too comfortable – no surprises here. 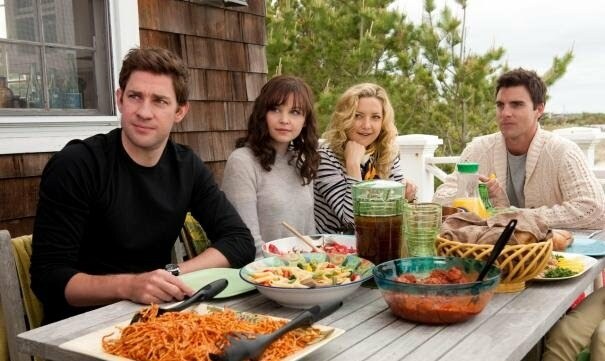 John Krasinski plays the third wheel in the childhood friendship. His character Ethan is closer to Rachel (of course) and as expected, holds her close to his heart. When Ethan expresses his feelings to Rachel, Krasinki’s performance is golden. You just want to give him a big hug. For me, that was the only heartbreaking moment of the film. The dreamboat in the cast of characters, Dex (seriously, very cheesy) is Colin Egglesfield. The five years he spent on the daytime soap ALL MY CHILDREN prepared him nicely for this role. He’s impossibly handsome, has a killer smile, is charming, but has absolutely zero substance. I’m sure he’s great in bed, though. He probably smells really good too! I’m sure there are lots of public references to him being a young Tom Cruise look alike. There were moments I thought I might be watching TOP GUN with those pilot sunglasses. He’s a hottie, for sure, but did not come across as a man to fight over. All the right elements, I mentioned. We were treated to love scenes on roof tops, the Hamptons, comic relief in the form of a horny cousin of Dex’s, the girls’ sleepover night with dance scene bonus and even a night time run-in-the-rain moment (Dex didn’t get wet in the scene, so points removed there). There was plenty of good conversation between Rachel and Ethan and sappy, girly moments between Rachel and Darcy. The film played out exactly as expected with neither a twist nor a turn, nor even an unhappy ending. It was not the best romantic comedy I’ve ever seen, clearly. I’m patiently waiting for another WHEN HARRY MET SALLY or 27 DRESSES, but until that little gem comes along, SOMETHING BORROWED fills the time and let’s me mindlessly enjoy a story which has been told a dozen times, this time with really good looking and/or likeable characters. Side note – I’d love to see John Krasinski in the lead role of this genre. Girls would swoon and cheer for him to get the girl in the end. Trust me. He’s adorable. Take note – stay to watch the credits, as there is one quick scene with Darcy and Ethan and a “To be continued…” announcement. I’ll venture to say the title will be SOMETHING BLUE and that perhaps that darling John Krasinski’s Ethan finally finds love. With a commitment from the gals to get out on the town more (and to help re-introduce me to my hometown after being overseas for 8+ years), we met in Pacific Beach to try Caffe Bella Italia, as well as take advantage of a Groupon offer. We weren’t the only ones who had waited until the last minute to use the Groupon. We had to take an early reservation and were seated outside due to the high volume of Groupon reservations (this is when the whole coupon thing becomes unappealing to me). Fortunately it was a pleasant, warm evening and so a patio seat and our bottle of wine set the tone for girl talk. My friends ordered the lobster ravioli and the lasagna. I opted for the saffron gnocchi. Once our order arrived, we claimed the dishes to be “tasty” “delicious” or “really good.” The portions were well-sized, but none of us finished our meal. To be truthful, there was nothing special about the food, presentation or menu. It’s hearty Italian food without any fuss or pizazz. Unfortunately, there’s nothing special to write about. Caffe Bella Italia does advertise Happy Hour, discounted bottles of wine and wine tasting specials, but after a lackluster meal, I’m not sure that we would make a return visit before trying out a plethora of options in PB or elsewhere. It’s hard for me to dislike Italian food, but this was a miss for me. Dislikes: Unimaginative menu, no WOW factor. That and – What’s up with that logo? In an effort to get out and about and try new-to-me restaurants and hot spots in San Diego, I rallied my gal pals for an evening on the town last night. Michelle had a Groupon for the Wine Pub in Point Loma and so that assisted in our decision. As we arrived, I was a bit hesitant, as the entrance is through a mini mall in a high traffic area on the cusp of Shelter Island and Point Loma. We managed to find parking in the back where we could see that a private party was occupying the lovely outdoor patio. Carrie was waiting for us inside and we nestled into our table by the window. Once inside, the atmosphere is warm and welcoming with a long bar and both tall and short table dotting the widows. Unfortunately, no view here. What the Wine Pub lack in location, it makes up for in friendly staff and wonderful food and wine. Sean greeted us and helped us to order a few specials on the menu, a pastry-wrapped, baked brie, the hummus plate, shrimp cakes and for me, the Greek Olives. (Ever since my trip to Greece in 2007, I can never eat enough of these beauties!). Sean also guided us through the wine menu and helped us land in the Cabernet Sauvignon, Vinum Cellars, California (2008). It was the description, “Huckleberry and blueberry, with soft vanilla tannins 6” that lured us in, the huckleberry being the largest draw. And we were not disappointed. Full, smooth and a perfect wine to enjoy on a Saturday night out with the girls. Our bill came to about $88 and while that didn’t qualify for the $100 tab needed to get the 50% off on the Groupon, the owners were kind enough to give us $25 off. Our wine and appetizers were delicious, the staff super friendly and the experience cozy and content. I would be interested to return for a dinner, or for some more tasty appetizers and a chance to enjoy a summer evening out on that patio. Check the website or facebook page often, as they host a variety of tastings and events, as well as Woofer Wednesday, where if you bring your pooch in and dine on the patio and they’ll donate 10% of your check to Loving Arms Pet Adoption.